So, in the same month that the UK Government is making political capital from attaching long prison sentences to several new drugs few people have even heard of, in a seemingly parallel universe not populated by drug warriors, other countries are queuing up to decriminalise personal possession of all drugs. Last week Mexico joined the growing list and today the Argentine Supreme Court is expected to issue a ruling decriminalising drug possession for personal use. According to some reports, Brazil and Ecuador are considering similar steps. The case has been under consideration by the high court for almost a year. The Argentine federal government has been reviewing its drug laws with an eye toward abandoning repressive policies toward users and is waiting for this case to be decided to move forward with new legislative proposals. Supreme Court Justice Carlos Fayt told the Buenos Aires Herald that the court had reached a unanimous position on decriminalization, but declined to provide further details. A positive Supreme Court decision on decriminalization would ratify a number of lower court decisions in recent years that have found that the use and possession of drugs without causing harm to others should not be a criminal offense. On Thursday Mexico finally enacted legislation to decriminalize personal possession of small quantities of all drugs (plans reported/discussed in more detail here back in May). The legislation will operate in a somewhat similar fashion to the Portugese approach with arrested individuals having to agree to a drug treatment program to address admitted addiction or enter a prevention program designed for recreational users. penalties for those who refuse to attend one of these kinds of programs under the Mexican scheme have yet to be clarified. The Mexican legislation defines threshold quantities of drugs under which which a designation of personal use can be made. These include 5 g of cannabis, or half 0.5g of cocaine, 50mg of heroin, LSD 0.015mg, and MDA/MDMA/methamphetamine all at 40mg (or 200mg for pills). Problems with such thresholds to make a distinction between possession for personal use and intent to supply offences have recently been discussed in a the context of UK legislation ( see appendix of this Transform briefing). The response from the US has so far been somewhat muted, in stark contrast to the uproar that greeted similar proposals from the previous President Vincent Fox in 2006 , which were abandoned under extreme pressure from the Bush administration. In many respects the legislation represents a formalisation of what was widespread tolerant policing practice - so may not have a huge impact on the ground. Mexico joins a growing list of countries around the world that have either made similar moves or have them in the pipeline (see further reading below). Such moves - it is important to note - only address personal possession and use and do not involve decriminalisation or legalisation/regulation of drug production and supply which remains in the control of criminal enterprises. The UN treaties, whilst theoretically allowing moves towards decriminalising (or at least depenalising) personal use, specifically outlaw exploring options for legal regulation of production/supply. That said - there is an increasingly active debate in Latin America around such moves (see below). This is a short clip from MSNBC news, featuring interviews with the authors of a recent Washington Post article 'It's time to legalise drugs'; Peter Moskos, a professor at John Jay College of Criminal Justice and the author of "Cop in the Hood", and Neill Franklin, a 32-year law enforcement veteran. Both served as Baltimore City police officers (home of 'The Wire') and are members of Law Enforcement Against Prohibition. "Only after years of witnessing the ineffectiveness of drug policies -- and the disproportionate impact the drug war has on young black men -- have we and other police officers begun to question the system. Cities and states license beer and tobacco sellers to control where, when and to whom drugs are sold. Ending Prohibition saved lives because it took gangsters out of the game. Regulated alcohol doesn't work perfectly, but it works well enough. Prescription drugs are regulated, and while there is a huge problem with abuse, at least a system of distribution involving doctors and pharmacists works without violence and high-volume incarceration. Regulating drugs would work similarly: not a cure-all, but a vast improvement on the status quo. Legalization would not create a drug free-for-all. In fact, regulation reins in the mess we already have. If prohibition decreased drug use and drug arrests acted as a deterrent, America would not lead the world in illegal drug use and incarceration for drug crimes. We simply urge the federal government to retreat. Let cities and states (and, while we're at it, other countries) decide their own drug policies. Many would continue prohibition, but some would try something new. California and its medical marijuana dispensaries provide a good working example, warts and all, that legalized drug distribution does not cause the sky to fall. Having fought the war on drugs, we know that ending the drug war is the right thing to do -- for all of us, especially taxpayers. While the financial benefits of drug legalization are not our main concern, they are substantial. In a July referendum, Oakland, Calif., voted to tax drug sales by a 4-to-1 margin. Harvard economist Jeffrey Miron estimates that ending the drug war would save $44 billion annually, with taxes bringing in an additional $33 billion. Without the drug war, America's most decimated neighborhoods would have a chance to recover. Working people could sit on stoops, misguided youths wouldn't look up to criminals as role models, our overflowing prisons could hold real criminals, and -- most important to us -- more police officers wouldn't have to die." This useful visual taxonomy of psychoactive drugs is from the brilliant Information is Beautiful blog (July 09). Click to see full resolution. 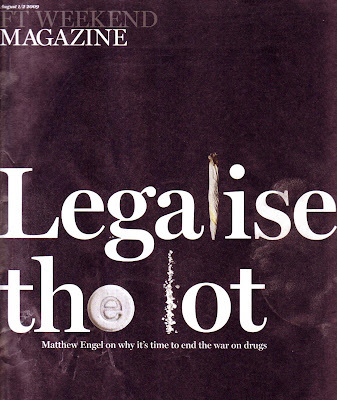 FT weekend magazine cover story: "Legalise the Lot"
We mentioned this excellent recent article by Mathew Engel in the Financial Times in the miniblog but I thought it was worth posting a scan* of the FT weekend magazine cover. That this article appeared in the FT is significant given its readership and prestige within the media, and the fact that it made the magazine cover so prominently is testimony to how mainstream the reform arguments have become. We have finally given in to the inevitable and set up shop on Twitter. You can find our twitter page here . On top of any other pertinent 140 character drug policy musings we may have, the Transform blog and miniblog posts both automaticallyfeed directly into our Twitter. We will also be building up a collection of other interesting twitter activity to follow - so please post links below. The US Government will to pay you to grow cannabis and roll joints for them.